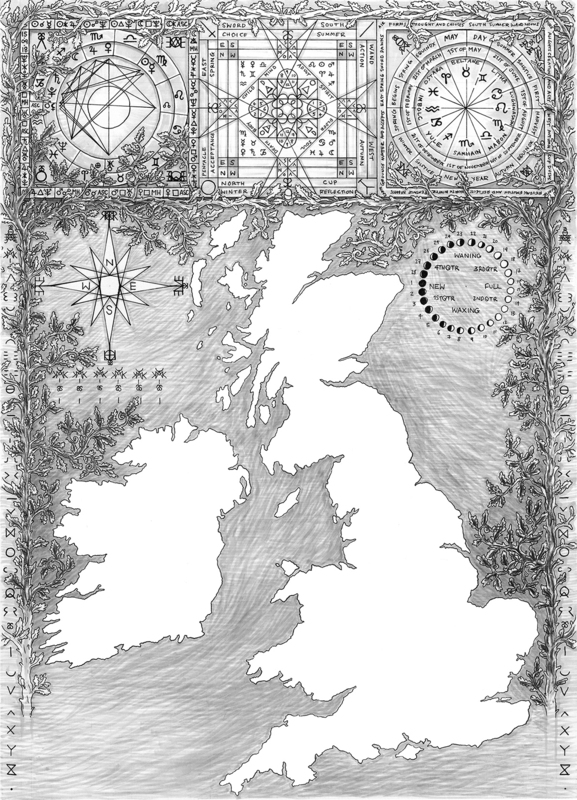 This map has been designed by Artist Ben Jeans Houghton. Over the course of the Waking The Witch touring exhibition, points of magical significance will be added to the locations of the map. Entries will be made by the exhibition's contributing artist and curators alongside contributions from the public. Top left of the map is an Astrological Birth Chart describing the positions of the planets and their aspects in relation to each other on the day of the opening. In the centre is a paired down Mandala from Ben's own magical system and to the right is a wheel of the year showing dates of seasonal significance. Click on the map symbols to be guided to information about each location. "Roughting Linn is one of those places where the problems of history and historicism feel like a thankfully absent footnote. You can look at the cup and ring marks carved in the rocks before the written word and bar the modernity of the clothes you bring with you, it could be anytime, timeless. The domed outcrop sits nestled in a grove of birch trees, some young, some old now, dancing in slow motion to a downward crescendo in step lead by the bracket fungi that call them home. Further on but close by there is a beautiful waterfall surrounded by moss drenched rocks. I once saw the sun break from a bank of clouds and cast a rainbow over the waterfall that was so bright my eyes were singing." Oriel Davies Gallery is the first venue on the Waking the Witch tour. With great reliance placed on the power of the wise man or the wise woman, witchcraft in Wales had long been connected to healing. For most of the Middle Ages the word witch really meant the local healer, someone who made poultices and medicines and perhaps had charms or spells for healing cattle and other farm animals. This seems to have rung especially true in Wales, where there were relatively few witch trials. Only five Welsh witches were executed for their supposed crimes during the “witch craze” in the 16th and 17th centuries. 20-21 Visual Arts Centre will host the culmination of the tour from 18 January - 18 April 2020. Based in a converted and deconsecrated church, 20-21 Visual Arts Centre has over the past fifteen years developed a great track record for offering a varied and exciting exhibition programme of contemporary art. They show around 20 exhibitions per year, across six exhibition spaces, and aim to be as ambitious and creatively diverse with their shows as possible. As well as bringing arts and culture to the local community, 20-21 Visual Arts Centre aims to show art by groups that are underrepresented in mainstream galleries and the art world. Sidney Cooper Gallery is the second venue on the Waking the Witch tour and is located in the historic city centre of Canterbury. Just up the high street from the gallery is a reconstruction of a historic ‘dunking chair’ suspended over the Stour River. These chairs were used to “test out” if women were witches or not by submerging them in water and seeing if they would float. Sidney Cooper Gallery was founded over 150 years ago as a place to experience, discuss and create art. For more information about our programme of exhibitions, workshops and events, visit the link below. Waking the Witch will tour to Bonington Gallery in Nottingham Autumn 2019. Bonington Gallery is an exhibition space and curatorial entity situated within the Bonington building at Nottingham Trent University. The gallery delivers a programme of exhibitions, initiatives and events that aim to solidify its position within the city as a leading exponent of innovative exhibition practice. "My Grandparents lived 9 years of their lives at sea on a small yacht, not a showy thing but a working boat. On their travels they stopped at an island and my grandmother swapped a box of Catherine Cookson novels for a bag of rose quartz with a prince. They stopped in New Zealand where my mother was born, built two houses there and later settled in Kent, at Margate, by the sea. As a boy I would visit them and go walking along the beaches, flanked by huge chalk cliffs riddled with smugglers caves that I relished exploring. One day they took us to the shell grotto that was Discovered in 1853 by a boy digging a duck pond. The origins of this maze of underground tunnels and chambers covered in 4.6 million shells remains a total mystery. The feeling inside was damp and calm and electric. I could feel that much had happened there and that magic had been made. I felt then that the grotto, in truth a temple and albeit a material place, was etched into the immaterial world, deliberately built in both worlds at once and is still used in that way remotely, to meet and make and learn." "We went to a summer solstice rave on the beach just past Bamburgh Castle. We parked up near the golf club and walked along the cliff edge with the sea on our right and made our way down to the dunes. There were mushrooms growing out of the sand which was something I'd never seen before. By the time it was pitch black it was low tide, the sand stretches out for a huge distance there. We all decided to go and have a swim together and on our approach to the sea's edge our footprints set off glittering blinks of blue light in the sand. It was staggering, like little universes coming into being then fading away in our footsteps. As we got to the sea's edge the lapping waves were glowing like blue flames. As we started swimming plumes and ripples of phosphorescent light billowed out behind our movements. The presence of these lights in the dark made the ineffable all-living reality of life palpable. Everyone went as silent as when a great meal is shared between hungry friends. All you could hear were gentle gasps, exhales or release and the lapping water as it lit the limits of our bodies, communicating our shapes in the night seas depths." "I visited the Giant's Causeway sometime before I was five years old. I have no clear memories of it but the hexagonal basalt columns impressed themselves upon me to the point that variants of them have featured prominently in the landscape of my dreams and recurring dreams ever since. I was once part of a dream workshop with a Finish Shaman at one of the Uk dream Conferences in Durham. She asked if anyone had a dream they were happy to share. I offered a dream where I woke up in a tent on a beach flanked by cliffs made of these basalt columns. After listening to the dream in full the Shaman assigned roles to the other participants and arranged them around the room. An old man was to be the cliffs, two women made an arch and became the tent, others populated other aspects of the landscape and the characters I met. Then one of the women participating was given the role of me and invited to wake up in the tent and re-experience the dream. I watched in silence as she wandered around the symbolic landscape of my dream in an unfolding dialogue with the Shaman, sharing her insights and recanting new pieces of information. The experience moved me greatly. I still visit huge coves and rock pool beaches a lot in my dreaming. I have been to sea temples and altars, places so full of elemental spirits that being human there becomes such a tiny experience."